It’s always nice to say thank you, and there are occasions when you need to say thank you to a colleague, but might wonder how to do it without looking like you’re kissing up. Sure, sometimes it’s great to send a note on formal stationery, but other times it would be fine to just say thank you, text it, or email it. On this page you’ll get some information and ideas on when and how to send your thanks along with a few sample messages to make things easy. Are you worried a card will look too formal? A great rule of thumb in the workplace is to respond in kind. Did you receive a printed invitation to go to a dinner party hosted by a colleague? Then sending a thank you for dinner note via a printed card is great–preferably by mail. Did your company mail you a bonus? Send your supervisor a thank you for the bonus note is also perfectly acceptable. Another time to send a note is if when you received the gift or favor, you did not get to say thank you in person AND you don’t regularly see that person during your workday for enough time to say thanks in person. 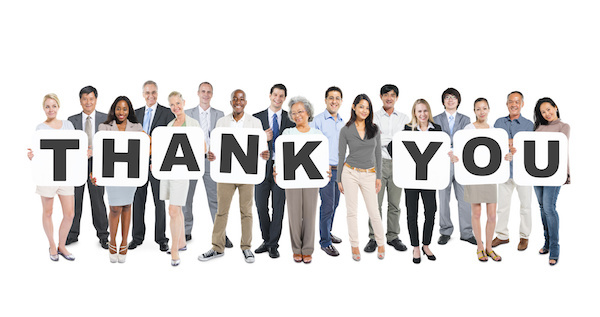 They key to saying thank you to colleague is to keep it genuine and simple. Just saying “Thank you for buying me that drink last happy hour,” is a quick and easy way to share your gratitude. And the more you share your gratitude the more things you will have to be thankful for. There are few other occasions when you should send a thank you note or even a thank you gift. Send a note and a small gift to the organizer of an office baby shower or retirement party. If you are invited to a sit down dinner with an associate for social purposes, it’s a great idea to send a thank you note to the host or hostess of the party. Thank you for organizing such a wonderful baby shower (or retirement or birthday party). The food and all of the decorations were wonderful. With so much to do at work, it means so much to me that you went above and beyond to put together such a fun event. Thanks again. If you receive a gift from someone at one of the parties, and you did not get a chance to thank them in person before they left and you don’t work with them regularly (i.e. they work in another department or you’ve retired and will no longer be in the office), then send them a note. If you’re close friends you, you can text them a thank you. Thank you for the wonderful (insert gift)! I missed the chance to tell you at the party but wanted you to know how much I appreciated it. Thanks again. Thank you for the (insert gift) and coming to the party. Your presence at the party made the occasion all the more special, and your thoughtful gift was icing on the cake. Thanks again. Thank you for the gift card to (insert store card, restaurant card, movie card). It’s one of my favorite places to shop (dine or go). A fun and thoughtful gift (or kind and thoughtful or generous and thoughtful) from a kind and thoughtful friend (or generous and thoughtful). Thanks again. Thank you for your help with the (insert description or Case name) project. Your input and dedication contributed greatly to its success. As always, it was a pleasure working with you. Thanks again. If the initial overture was made via Social Media such as an invite to a party, messaging or posting thank you is fine. You can message someone personally or post on the public page of the invitation. Thank you for hosting such an awesome party! You rock. You know how to throw a great party! Thank you!